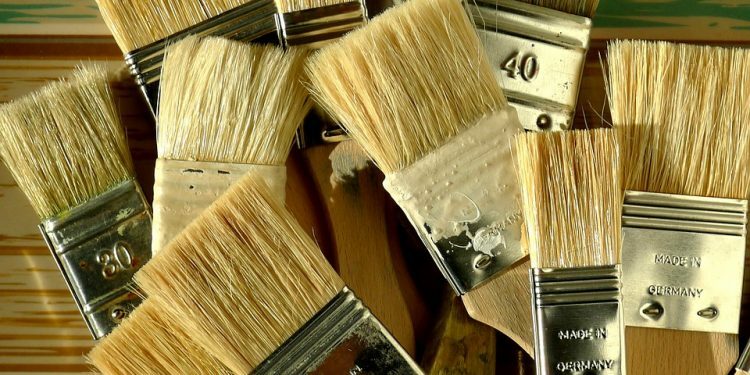 Always clean your paintbrushes right after you finished using them. Do not wait until the next day. Do not even wait for a few hours. When using latex paintbrushes, rinse them with hot water. Use one of your hands to work paint through bristles. Push brushes against sink base and then let the water go through it until the water you see runs clear. In the event you used oil-based paint you want to dip your paintbrush in solvent and then swish it from one side to the other while using bucket edges to push paint out. Do refresh solvent for the final rinse and use small quantities at a time. When there is excess paint noticed between bristles, use combs to not damage them. Never use wire brushes. Scrub pads should be used to wipe bristle outsides while ferrule removes the dried paint. Always dry your paintbrush by knocking it or spinning it. Do re-form bristles in the original shape by using your hand. After, place your brush back in the keeper or in a folded newspaper so that form remains while drying. As you can see, there is not much that needs to be done as you are cleaning your paintbrush. Just remember to do this every single time. Even letting the brush stay with the paint on it and in it for a few hours can lead to irreparable damage.